FAQ: So How Long Will Those Screens Last Anyway? This is a question that I get asked frequently by friends and customers, and the answer is simple and complicated at the same time. Welcome back friends, my name is Dave Luttrell Production Manager at Abante Marketing and all-around screen-printing geek. Today I’m going to take you on a journey of both time and space. This may seem silly, but the screen is just the mesh stretched over a rigid frame, which should last years. I have personally seen screens last around 20 years. On the other hand, if something or someone hits the mesh with a sharp object and it rips a big hole in it, or if the mesh loses its tension that screen is done. What I end up finding is that what most people really mean by “screen” is the frame /mesh/ stencil combination that is used to print a particular design, and that answer in our shop is approximately 3 weeks. 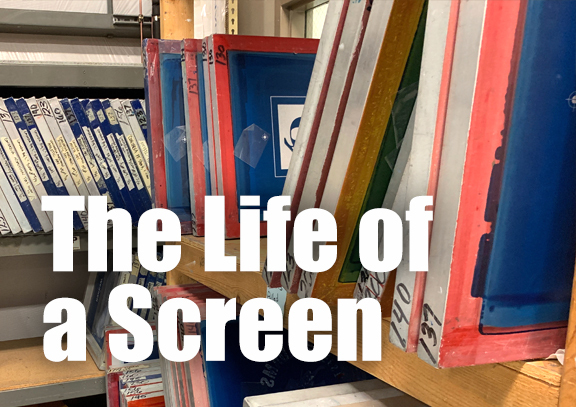 Not because it wears out or anything strange happens to it but because most production screens move through a job life cycle. In illustration 1 you can see what I mean by the frame/ mesh/ stencil combination. For simplicity we are just going to refer to this as the screen. You can see the frame in this example is a rigid aluminum frame with fine poly thread stretched over it to tension. This tension is measured in foot pounds called Newtons, the higher the newts the tighter the mesh. We need a minimum of 20 newts for quality work. Also, the mesh comes in a wide variety of thread counts measured in threads per linear inch. More threads mean higher detail but less ink flow due to the smaller openings between threads. Most standard jobs use mesh counts between 140 -230 threads per inch. The screen mesh and frame are cleaned and all contaminants like grease and dirt are removed. 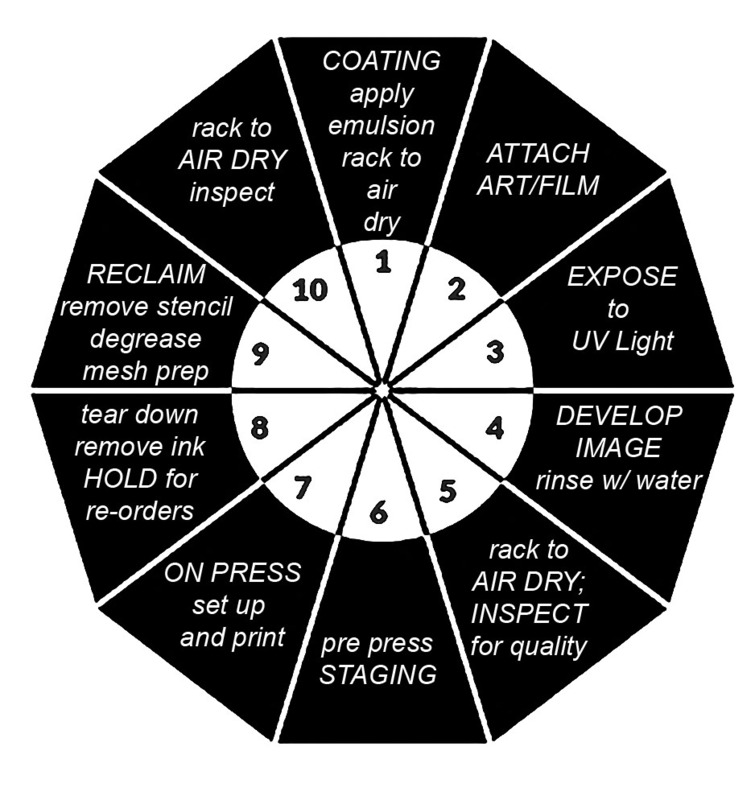 Once cleaned, completely dried and inspected a thin layer of light sensitive emulsion is applied in a light safe darkroom. This emulsion is amazing stuff, we use a very high-end emulsion because it’s just better simple as that. If you want great screen prints you need great screens and emulsion is key. Once the emulsion is dry we can attach the art (color separated film positive) to the screen in the desired place and expose it to UV light. This will make the exposed areas resistant to solvents (ink) and water and the areas that were not exposed to the light (our image) will easily rinse away with water leaving a stencil. Next the screen needs to be completely dried and inspected for flaws, before its ready to be staged for the press that job is scheduled on, I try to have all our screens ready for press the day before production to leave time to fix any problems and still hit our due date. When the press operator is ready all screens for that job will be “set up” registered in order on the press. The first print will be inspected and approved. You know you have good screens when you don’t hear any complaints about them. When the job is complete, the excess ink is taken out and the screens are held in a staging area for approximately two weeks, this leaves a little time for the customer to get the shirts and place a re-order if needed. After the holding period of two weeks is over the screens can go back to the screen department to have the emulsion/stencil removed and the mesh prepped by having all contaminants removed. The screen is now back to its natural state of just frame and mesh ready to be coated with emulsion and start the journey through time and space all over again. This goes on over and over until something happens to it. So how long will those screens last? …Until something happens to them, and a lot happens to them every day. Check out Dave’s other blog contributions.